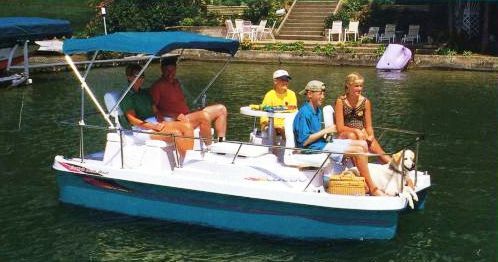 THIS IS A REAL BARGAIN AT ONLY $3995.00 THE LARGE 23 INCH PONTOONS ARE VERY STABLE AND PROVIDE GOOD SPEED WITH A SMALL MOTOR. 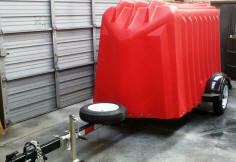 MOTORS AVAILABLE FOR THIS UNIT, USED 20 HP, NEW 20 HP, 3 USED ELECTRIC, AND A FULL SELECTION OF THE NEW TORQEEDO ELECTRICS. 2006 ELDEBO PONTOON, TRAILER, BIMINI TOP, 4 NEW BATTERIES, MOTOR JUST OVERHAULED ! HURRY IN FOR THESE USED , ALL ON SALE NOW! USED 14 FT. IN LIKE NEW CONDITION. THE FISHING MACHINE INCORPORATE ALL THE LATEST IN TECHNOLOGY AND THE LATEST INNOVATIONS IN PONTOON MOTOR DESIGN. THIS PONTOON IS AVAILABLE FOR SEATING FROM 1 TO 5 PEOPLE AND IS SALE PRICED AT A UN BELIEVABLE STARTING PRICE! COME IN AND LOOK! PHOTO IS ANGLED FRONT FENCE STANDARD HEIGHT AVAILABLE OR A 18 INCH ALL AROUND FENCE. NOTICE THAT THE PONTOON SITS LEVEL AND HIGH IN THE WATER. THIS CAN CONVERT TO A BLIND WITH ACCESSORY KIT. 16 FT X 6 FT. 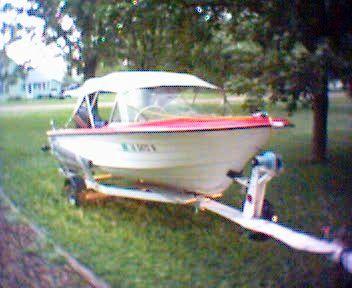 WIDE FISH N CRUISE ALSO COMES IN A CRUISE MODEL ON SALE NOW! GOOD SELECTION OF JET SKIS AND JET BOATS USED. SOME ARE COMPLETELY RECONDITIONED, NEW JETS PROPS, ETC. OVER 100 USED RECONDITIONED CYCLES IN STOCK ALSO.